Millions of Americans are choosing to exercise a great civil right fought for and won by our Founding Fathers: the right to bear arms. It’s not about hunting; they didn’t give their lives and fortunes to defend that. It’s about your right to defend yourself, your loved ones, and maybe even a stranger, from those who mean to do harm. In the days of our Founding Fathers, carrying a weapon was normal and very accepted. They probably could not have guessed there would come a time when doing so in this country would be considered taboo by some. It’s a good thing there are millions who carry concealed and stand up for their rights to carry a weapon for personal protection. The question of “Why do you carry?” is almost as easy to answer as “Why do you have a fire extinguisher in your home?” You carry because intentional violent crime occurs every second in our world and your safety is your own responsibility. Yes, you can and should call the police if you are attacked, but they are always minutes or hours away. If a fire extinguisher gives you a chance until the firefighters arrive, then a handgun gives you a fighting chance before the police can respond. From FBI statistics, we know that every year at least 2.5 million Americans defend themselves with firearms against criminals, with the handgun being the most common weapon of choice. Of that number, at least 200,000 are women who save themselves from sexual assault. Take those statistics with a grain of salt, though, because many firearm defenses are never reported, and are successful without a shot ever being fired and no one harmed. Concealed Carry Reciprocity Passes U.S. House of Representatives! In a resounding show of support for the Second Amendment, the U.S. House of Representatives on Wednesday, December 6, 2017 passed a legislative package that included H.R. 38, the Concealed Carry Reciprocity Act of 2017, and H.R. 4477, the Fix NICS Act of 2017. The bipartisan vote of 231 to 198 advanced a measure that would allow law-abiding Americans who are eligible to carry a concealed handgun under the law of a state to do so in all other U.S. states and territories that recognize the right of their own residents to carry concealed. Without a doubt, this is the strongest piece of self-defense legislation to ever come before Congress. It would also help shore up the National Instant Criminal Background Check System used for licensing and retail firearm purchases by adding additional layers of transparency and accountability to the system. With this vote, the U.S. Congress ratified the premise that firearms in the hands of law-abiding Americans are a force for good. This of course has been borne out again and again over the past three decades, as more and more Americans have embraced their right to bear arms for self-defense through concealed carry. The nation’s violent crime rate has fallen to historic lows during this time, and concealed carry licensees have proven themselves one of the most law-abiding populations in America. Today, all 50 states have laws under which residents may carry or apply to carry a concealed handgun for self-defense. Forty-two states and the District of Columbia broadly recognize a right to do so. The remaining eight states, however, have laws that allow even the most qualified applicants to be denied a license unless they can show an extraordinary “reason” for having one. This results in an arbitrary and unconstitutional system where people are denied their right to carry not because they’re a public safety risk but because licensing officials simply don’t believe that “ordinary” people should have the right. Meanwhile, favoritism and corruption are permitted to flourish, with licenses handed out to celebrities, rich political donors, and sometimes even applicants with disqualifying backgrounds who can afford to bribe the right people. If you’re an aspiring concealed carrier, the more you read and talk to others, the more you’ll discover the myriad of variables available when shopping for a concealment holster. In addition to considering price, quality, and carry style, also consider accessibility, concealment, and comfort. Accessibility — how quickly you can get to your gun — is far more important than the type of gun you carry. In an emergency situation, you can’t get to your gun too quickly! When shopping for a carry system (gun +holster), look for a combination that gives you rapid, efficient, and instinctive accessibility. That could be an inside-the-waistband (IWB) or an outside-the-waistband (OWB) holster positioned on your hip, your center line (a.k.a., “appendix carry”) or your ankle or a shoulder holster. It might also be a pocket carry holster. Or a holster inside a specially-made garment. Some gun experts say retention holsters add time when drawing and add bulk. If you’re trying to conceal, both work against you. Others say the retention is there for a good reason. It prevents the firearm from falling out of the holster if you stumble, are in a car accident, get knocked down, etc. Most firearm “professionals” and instructors don’t recommend off-body carry (e.g., in a handbag or briefcase) because it isn’t ideal for accessibility (and could be dangerous if your bag is stolen). Most also do not recommend carrying SOB (small of back). That position has your gun as far away from the fight as possible. And when you are seated in your car, not only can it be uncomfortable, but it is completely out of reach. But of course no one knows what is best for you and your particular situation except you! Not every carry system is suitable for every person, given different body shapes, dress, activity levels, skills, etc. Most people who carry concealed do not have just one carry system; they have two or three and choose the one that best fits their circumstances. For example, when going to the theater or if you are seated behind a desk most of the day, you might want an ankle holster because that makes for an easy draw while sitting. But when you go to the mall or out for a walk or running errands, a belly band holster might be ideal. A plus to the latter is that an attacker is not going to take your gun away from you when it’s concealed under a shirt! The only way you’re going to know what works for you is to try several holsters. And, yes, that might mean buying several and never using a few of them as you conclude what’s best for your particular needs. A lot of gun people say “concealed means concealed.” In other words, no one should ever be able to tell that you are carrying a gun— especially in places where the general public might freak-out if they suddenly realized you do have a firearm. So choose a carry system that hides your gun without “printing” (revealing itself by making an impression on the cover garment). Again, it’s a process of trial and error to find the carry system(s) that are best for your wardrobe. You may have different clothing for different occasions and each require different carry systems. A scrub-wearing doctor with an ankle holster may switch to an IWB holster when he changes into casual clothes. Women wear dresses, skirts, shorts and pants; all of which may require a different carry system. If your carry system isn’t comfy to wear, there’s less of a chance you’ll wear it every single day. And you really do want to wear it every single day. How do you know if a carry system will be comfortable all-day, through a range of activities (driving, walking, shopping, working in the backyard, carrying a kid, etc.)? You guessed it again— you have to try it. It might take several holsters and months of trail and error until you are able to wear any outfit while concealing effectively and comfortably. Even if you buy a holster or two and don’t use it much, it’s not money wasted. It is worth the trial and error to get this right. 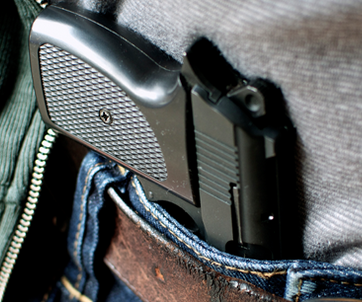 Carrying concealed should be both comforting AND comfortable, not one or the other. How Often Do You Clean Your Concealed Carry Firearm? How clean is clean enough when it comes to caring for your firearms? Or in other words, how dirty is too dirty? Everyone probably would agree that if you finish a 500-round training course and don’t clean your gun you could be setting yourself up for trouble in the future. Because of the tiny explosion in the chamber every time you pull the trigger, residue and sediment are left on the inside of the barrel, making it essential that you take the time to clean it to avoid dangerous malfunctions. Of course there are those guns we all have that just never stop working no matter how badly you abuse them. But what about cleaning your gun when you have not fired it? When should you clean the everyday concealed carry piece if all it does is ride around in your holster all day? A gun in a holster will pick up its share of daily dirt— but how much dirt is largely a matter of the holster material, the location of the holster on your body, and the amount of dust and dirt you are subjected to during the day. For example, a revolver carried in a leather ankle rig will pick up more dirt than the same gun in a leather hip holster. If you happen to be walking around lots of dusty parking areas with your gun in an ankle holster, you can count on even more dirt. On the opposite end of the spectrum, a handgun carried in a belly band holster will stay pretty clean. Still, after about week, it might be time to pull your gun out of the holster, unload it, and give it a quick once-over. Most of the time, the daily dirt will not hinder performance, but do you really want to take that chance? If you do a quick cleaning weekly, you may want to field strip the pistol and conduct a more thorough cleaning monthly. The goal here is to do this regularly so as to not let dirt build up. That would be a bad thing if it caused a malfunction. Disassemble your gun only as much as the manufacturer recommends. Check the owner's manual for disassembly instructions. Before you begin, double-check to make sure it's unloaded. Remember that your gun may still have a round ready to fire after you remove the magazine, so check and remove this round, too! Whether you're shopping for your first carry system (a carry system is defined as a gun plus holster), or are looking for something newer, easier, or just different than what you have been wearing, price, quality, and carry style are a few factors to consider. But Accessibility, Concealment, and Comfort are probably the three biggest factors to weigh when considering the holster part of your carry system. ACCESSIBILITY — how quickly you can get to your gun — is a far more important than the type of gun you carry. Provided you keep control of your firearm, you can’t get to your gun too quickly. When shopping for a carry system, look for a combination that gives you rapid, efficient, controlled and instinctive presentation. 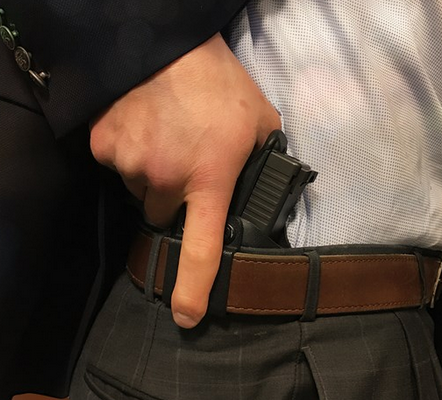 That could be an inside-the-waistband (IWB) or outside-the-waistband (OWB) holster positioned on your hip, your center line (a.k.a., “appendix carry”) or your ankle. It might also be a pocket carry holster. Or a holster inside a specially-made garment. There are also options for off-body carry (e.g., in a purse or briefcase), but quick accessibility might be compromised if your firearm is not directly on your body. Of course, not every carry system is suitable for every person, given body shape, dress, skills, etc. The only way you’re going to know what works for you is to try it. Wearing the clothes you are likely to wear when you’re carrying, try as many different types of holsters as you can with your safety-checked firearm. CONCEALMENT. Plenty of gun people say “concealed means concealed" and in no want do they want anyone to know they’re carrying a gun. If that’s you, choose a carry system that hides your gun without “printing” (revealing itself by making an impression on the cover garment). Again, it’s a process of trial and error, using various carry system with your normal clothes. All your clothes. You may have different clothing for different occasions that require different carry systems. 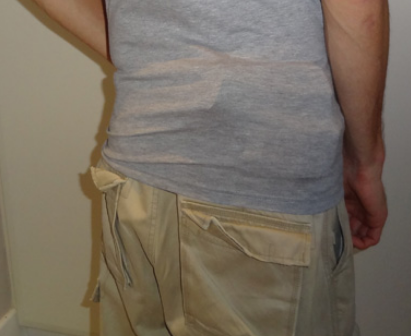 A scrub-wearing medical professional with an ankle holster may switch to an IWB holster when wearing casual clothes. Women wear dresses, skirts, shorts and pants; all of which may require a different carry system. COMFORT. Do you believe that conceal carrying a gun should be comforting but won't be comfortable? You want BOTH. If your carry system isn’t comfy to wear, there’s less of a chance you’ll wear it consistently. The only way to know if a carry system truly will be comfortable all day, through a range of activities (driving, walking the dog, shopping, sitting at a desk, working in the yard, carrying a kid, etc.) is to try it. And try it again. And again. It may take lots of experiementation before you'll be able to wear any outfit while concealing effectively and comfortably, but it’s worth the trial and error to figure it out. Ammunition can be used to describe a wide array of items, from the huge shells and powder bags used to load WWII naval cannons, loose powder and lead balls for muskets, or modern cartridges. The scope of this blog post focuses on modern cartridges. The bullet from a cartridge is used to create the majority of the data we use to characterize cartridges, most notably caliber. Caliber generally refers to the diameter of the base of bullet measured edge to edge. It’s not an exact naming convention however. For example, most .38 Special rounds actually measure 0.357 inches in true diameter, and a “.45 caliber” bullet could be as small as .451 inches or as large as .455 inches depending on the origin. Once cartridges are sorted into calibers, the bullet type is used to further differentiate them. The two major types of bullets are based on their construction: all lead or jacketed lead. An all lead bullet is about as close to a musket ball as you can get with modern firearms; a shaped chunk of lead with no external material. Lead remains the most common bullet material on the market for now; however there are several companies that produce bullets made entirely from a copper alloy. Jacketed bullets enclose the lead portion of the projectile with metal “jacket” material, usually made from a copper based alloy. The two most common jacket types are the full metal jacket, or FMJ which encloses the majority of the bullet but leaves the lead base of the bullet exposed; and total metal jacket bullets which fully enclose the bullet, including the base. Jacketed bullets were invented to deal with the problem of excess lead deposits in the barrel caused by the higher velocities associated with the invention of smokeless gun powder. PROJECTILE. Bullets are further broken down in to groups based on projectile shape. The most common jacketed bullets are commonly referred to as “ball” or “FMJ” ammo. Full metal jacket ball ammo is a lead core bullet encased in the aforementioned jacket material with no exposed lead in the frontal area of the bullet. The analogous all lead bullet is referred to as a lead round nose; its shape is similar to the ball ammo but lacks the copper alloy jacket. The next most common projectile shape is the hollow-point. A hollow-point bullet has a cavity in the frontal section of the projectile; this cavity is designed to react with the soft tissue and cause the bullet’s impact area to expand to a diameter greater than the base of the bullet. Hollow-point bullets can be found in all lead projectiles; for many years the standard issue cartridge for the FBI was a .38 Special semi-wadcutter hollow-point bullet that weighed 158 grains. The lack of a jacket on the now famous “FBI load” meant that bullet would generally expand to a considerable diameter. The current industry standard for hollow-point bullets is the modern jacketed hollow-point. Unlike the standard ball ammo, a jacketed hollow-point (JHP) usually has the base of the bullet enclosed by the jacket and some exposed lead in either the hollow-point cavity or around the nose of the cavity. The jacket material helps the bullet retain more of its weight after it’s expanded, giving it better penetration. This is especially important in defensive handgun rounds, which are limited to the single wounding mechanism of crushing tissue as they pass through it. Even though ball and JHP are the two types of bullets most frequently found; there are plenty of other types out there as well. CASE. Metallic cases are usually characterized by their shape, the type of rim, and the material they’re made out of. The case of a metallic cartridge is usually made of brass; other common materials are aluminum and mild steel. A cases’ shape refers to the amount of taper in the case walls or whether or not the case has a bottleneck shape. Bottleneck cases start with a larger diameter than necessary to fit the bullet, and are then necked down to accept a smaller projectile than the internal diameter of the case. An example of this is the .357 Sig, which starts a .40 S&W case, and then the open end of the case is reduced to properly fit a 9mm bullet. Tapered cartridges have a very gradual amount of taper to them, but lack a bottleneck. Cases can be further differentiated by the type of rim. Cartridges designed for revolvers will generally feature a prominent rim around the base of the case; the rim is greater than the diameter of the case itself and sets on the cylinder face. When the ejection rod is pushed, the revolver’s star grabs the case rim and manually ejects them. Most pistol ammunition is either rimless or semi-rimmed. A rimless case has a groove at the base of the case designed to accept the extractor claw on pistols. The extractor claw slides into this groove during the normal action of the firearm and then during the cycle of action post firing uses the groove to begin the process of removing the spent casing from the chamber. IGNITION. The last differentiation between types of cartridges is their ignition type. There are two ways in which the propellant in a cartridge can be ignited – rimfire ignition or centerfire ignition. Centerfire cartridges use a replaceable primer cap that is inserted into a pocket in the base of case. The primer is struck by the firing pin, and ignites the propellant. Centerfire ignition is more reliable and positive than rimfire ignition, which is a part of why all serious self-defense handguns use centerfire ignition. Metallic cartridges haven’t changed much since the early 20th century. The 9mm Luger was introduced in 1902, and with the exception of hollow-point bullet technology hasn’t changed in over 100 years. But even with technology this stable, knowing what each component of your cartridges does will increase your knowledge when selecting rounds for self-defense or target practice. By Caleb Giddings. Full article originally published in the May 2013 issue of GunUp the Magazine. Printing is where the outline of your gun appears from pushing against your clothing. Part of the gun might even by exposed when you are wearing the wrong garment. When you first start carrying, you’re usually so concerned about your gun showing in public you’ll do anything to make sure it never happens. But after carrying every day for years, you might get a little lax, so it's good to have a reminder. Take an extra moment and make sure you’re not printing. Generally speaking, dark-colored shirts and blouses will conceal your firearm better than light-colored. Compared to exposing your gun, however, printing is nowhere near as big a concern. If your gun is exposed, you could find yourself in some serious trouble. The last thing you want to deal with is law enforcement bearing down on you with guns drawn because you bent over to pick something up and the lady behind you noticed your gun. Just because you carry a gun doesn’t mean you’re doomed to a life of Hawaiian shirts and baggy pants. But too-small garments won't do you any favors either. You can still have a sense of style while carrying, just be sure that the clothes you’re wearing accommodate the gun you carry. With a little bit of experimentation you'll find the best way to carry and still look good and be comfortable. Also keep in mind that wearing tactical-looking clothing screams gun to the general public. The idea is to conceal the fact you have a gun on you, not announce it to the world. The benefits of a quality holster cannot be stressed enough. Don't select a holster solely based on price. There are some quality holsters on the market that aren’t overly expensive, and some pretty awful holsters that cost way too much. Whatever material you prefer for your holster, it needs to be able to retain your gun properly and be comfortable enough to wear day in and day out. Experiment with several different holsters to find the one that properly fits your lifestyle and your body. This is a bad habit often seen by those just starting to carry concealed. As you go about your daily routine, you might casually touch the gun with their fingers to see if it’s still there. If you’ve gotten a proper holster, your firearm definitely will still be where you put it! Suppress the urge to finger or constantly check your gun— leave it alone! Of course if your holster has slid into an uncomfortable position and you need to re-adjust your holster, of course you have to fix the problem, but not in public. The movement of re-adjusting will draw quite a bit of attention to yourself, much more so than just touching the gun. Find a restroom stall, dressing room, or your car— some place private to fix whatever needs to be fixed without worrying about someone figuring out what you’re doing. If you’re going to carry, do your best to carry all the time in every place it is legal to do so. You wear your seat belt every time you drive, right? Same goes for carrying your gun. You never know when you’ll find yourself in a situation where you need it, whether you’re away from home the whole day or just making a quick run to the convenience store. Incidents happen when you least expect them, it pays to always be prepared. Most men and women who carry concealed are extremely responsible and have the mindset that they’ll do everything in their power to avoid a conflict. But if violence comes their way, they’re prepared to do what it takes to protect themselves and their family. This is a great mindset to have. The biggest mistake is having an invincible or escalation mindset. Just because you carry a gun doesn’t mean it’s OK to walk down a dark alley or intentionally escalate a fight. In fact, it means the exact opposite. By carrying a gun, you must do everything in your power to avoid trouble. Likely you will never have to use your gun in a self-defense scenario, but should the absolute worst happen, you and the police will know you had no hand in bringing the situation upon yourself. Don’t make it easy for anyone to doubt that. If the words “get in touch with your inner [fill in the blank]” make you want to stop reading right here, give it a sec.... in this case, getting in touch with your inner natural point of aim is something you might actually want to hear about... and try. The concept of finding your natural point of aim applies mostly to leisurely shooting. It’s helpful to know what it is, how to find it, and how it can help you to improve. The more that you’re on target from the start, the more you can focus on other elements of shooting like trigger control. Are the front and rear sights in the same plane or is one higher than the other? If you were holding a real gun, and aiming at a real target, most likely your sights would not be exactly where you wanted them to be. If that’s your result, you may want to try a gun with a different grip angle. The gun itself may support or work against your natural point of aim. Different handguns have different grip angles and sizes. Experiment with moving your strong side foot backward or forward from your current stance. You just might find that your sights move vertically relative to the target as you adjust your feet. Our natural tendency, when we find the sights aren’t where we want, is to push the gun and make a perfect sight alignment. Doing this works and you can hit targets, however, you’re doing more work than you need and repeatable accuracy will suffer, especially as your muscles get fatigued. Also, the process of raising your gun to a perfect sight picture will be a bit slower than if you started from a perfect natural point of aim position. To make this natural point of aim work best for you, think about moving your body parts so that the gun naturally aligns with your target without having to force it into position. Once found, the more you practice a shooting stance that embraces your natural point of aim, the more it will be programmed into your brain. When you line up to a target and raise your gun, you’ll find your body in a better position to make the shot. Of course in an emergency or dynamic shooting scenario, you’re not going to worry about finding your natural point of aim. But when you’re practicing at the range, you have the time to find the stance and position relative to the target that lines you up – naturally. When you think about it, embracing your natural point of aim is a common sense concept. So take advantage of the way your eyes and body parts naturally want to operate. Is Open Carry a Good or Bad Idea? Practicing open carry gives up the tactical advantage a concealed weapon provides you. Advertising a weapon is an an invitation for a thief to try and steal it. Just because there is a legal right to do something, doesn't mean it is the correct common sense choice to make. If you already have a conceal carry license and carry everywhere, why would you need to let everyone else know you have a gun with you. Criminals prefer unarmed victims— if somebody sees you with a gun they're less likely to try and make you their target, or commit a crime in your vicinity. Make open carry a normal part of the day; after a while it will become common place and the general public will see that just because someone has a firearm on them doesn't mean they intend to commit a crime. After a while of experiencing no negative consequences, folks won't bat an eye and guns will stop being so controversial. Under the current concealed carry laws, if anyone see your weapon, even by accident (your shirt comes untucked or your jacket swings open) then you are breaking the law, whereas with open carry, you could still carry concealed without the worry of the weapon accidentally being exposed and putting you inadvertently in danger of breaking the law. No matter if you decide open carry is a good idea or a bad idea, overcoming anti-gun prejudice in general is something we can all agree on. Doing so requires that everyone be the best gun owner you can be. Carrying open or concealed has advantages and disadvantages, but everyone knows that without proper training and mindset, owning a gun is a poor decision. As a responsible gun owner, it is your duty to train properly either way you choose to carry. A castle doctrine (also known as a castle law or a defense of habitation law) is a legal doctrine that designates a person's abode as a place in which that person has certain protections and immunities permitting him or her, in certain circumstances, to use force (up to and including deadly force) to defend themselves against an intruder. 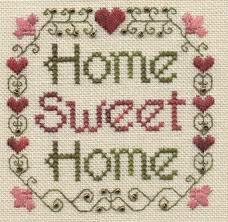 If someone breaks into your home while you are there, assume they are there to do harm to you. A hotel or motel room you rent may be covered under the castle doctrine, too. This is a very general description, and since the details of each state's doctrine varies, be sure to get the details that pertain to where you live or travel frequently BEFORE you face an invasion. Castle Doctrine laws most often instruct the courts that they must assume that anyone who breaks into your house while you are inside is there to cause you harm. But you still need to protect yourself legally as well as physically. The best way to do that is to establish that you are a reluctant participant in the deadly force encounter. Don’t go searching for the bad guy. Your problems don’t end when you shoot the intruder - they begin - so try to end the situation without using deadly force if you can. The United States Concealed Carry Association advises that your best bet is to try and call 911 first. Basically grab the phone and your firearm at the same time. If you can, before anything happens, give your location to the 911 operator. Then drop the phone and let the 911 operators hear you giving the warnings to the bad guys before you ever fire. Yelling "I'm armed! And I've called the police" is a definite way to bolster your position legally because it shows both your reluctance to shoot, and your having given the intruder his "last chance" to depart before you use force. Then essentially the prosecutor has to challenge your defense and prove that you voluntarily chose to fire and weren’t reacting to the situation. Not only will yelling that you're armed help in court, if needed, it could save a life. Not just the life of the "bad guy" but perhaps that of a drunk neighbor, a family member, or your daughter's boyfriend sneaking in or out. If the intruder IS a teenager or someone else who means no harm, they will likely run out or yell out not to shoot and give their name. If they DO turn out to be something more sinister, even a thug doesn't want to get shot, and your announcement may take them by surprise. They weren't expecting you to have a gun, so they may flee immediately. If the burglar heeds your warning and departs, let he/she/them do so and then let the police attempt to find them. Think about this scenario NOW, before you are placed in danger in the middle of the night. Always remember that in any deadly force encounter, even when it involves invasion of your home, deadly force can be used only as a means of last resort, when all lesser means have failed or cannot be reasonably employed. The situation surrounding the use of deadly force doesn't change the condition. Unfortunately, in our litigious society, even the dead can sue you, so clearly establish that you were left with no other option. You never want to kill anyone, BUT you also never want to be a victim! As always, this is not legal advice. Read and understand the laws of your state.